Imelda Bargas and Tim Shoebridge will talk about their experiences researching and writing the book New Zealand’s First World War Heritage. 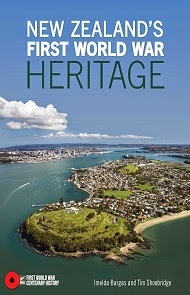 Published by Exisle Publishing in April 2015 New Zealand’s First World War Heritage tackles the First World War from a new angle: the places in New Zealand where it happened. No battles were fought here, but our landscape is signposted with thousands of poignant memorials and behind the facades of old buildings, beneath scrub and behind farm fences lies a less visible landscape of war and hundreds of stories waiting to be told: a soldier’s name carved on a remote railway station, a once bustling uniform factory in the heart of a city, a long abandoned gun battery. Imelda and Tim searched the country from Northland to Stewart Island and rediscovered a huge number of places with wartime associations: army camps, fortifications, soldier-settler farms, convalescent homes and hospitals, cemeteries and war memorials, dairy factories and woollen mills. In this talk Imelda and Tim will explain how they came to work on the book and some of the challenges they faced putting it together. They’ll also explore the themes covered in the book, using some of their favourite stories and sites. Imelda Bargas and Tim Shoebridge are Senior Historians in the Ministry for Culture and Heritage’s History Group. Imelda previously worked as a registration adviser for the then New Zealand Historic Places Trust while Tim worked as a researcher and report writer at the Waitangi Tribunal. Imelda has written extensively for NZHistory.net.nz, which she helps manage. Tim is the author of several books including The Good Citizen (2009), Quarantine! (with Gavin McLean, 2010), and Featherston Military Training Camp and the First World War (2011). Date: Wednesday 6 May at 12.15pm. Venue: Ministry for Culture and Heritage, L4 ASB House, 101 The Terrace, Wellington. To listen again to MCH History Group talks go to: http://www.nzhistory.net.nz/handsonhistory/downloads-and-podcasts.